The Brexit latest, the search for a plane carrying Cardiff City’s new signing and IT problems in court all make headlines on Wednesday. 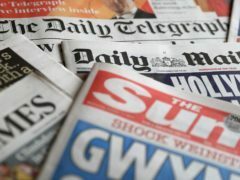 Boris Johnson’s comments on the burka and the death of seven-year-old Joel Urhie in an arson attack are among the stories making the front pages of Wednesday’s papers. The trial of England cricketer Ben Stokes features on the front of many Tuesday papers, alongside an extradition request for the Salisbury attack suspects and global warming fears. The ongoing crisis over Syria and Sir Cliff Richard’s legal battle against the BBC top the headlines on Friday. Strictly Come Dancing head judge Shirley Ballas has hit out at critics who have slammed her judging technique.